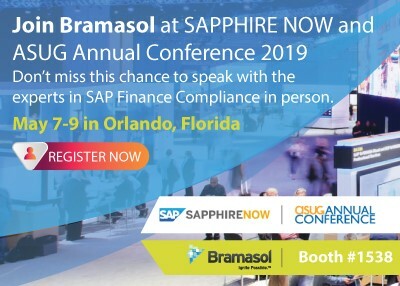 Santa Clara, CA – April 5, 2019 — Bramasol, a leader in SAP Office of the CFO Solutions, today announced that it will participate at SAPPHIRE NOW® and ASUG Annual Conference being held May 7-9 in Orlando, Florida in booth #1538. Treasury solutions for cash management, bank communications, asset tracking, global currency, risk management, ASC 815 and IFRS 9, FAS 133 and more. Future finance strategic solutions and a seamless roadmap for migration to SAP S/4HANA® and predictive accounting. Bramasol is a leader in SAP-based finance and compliance solutions and a premier services partner for the SAP Revenue Accounting and Reporting application (for ASC 606/IFRS 15) and leasing (for ASC 842/IFRS 16) and the SAP Treasury and Risk Management application. CFOs from the Fortune 500 choose Bramasol as the go-to partner for finance innovation and compliance solutions for companies looking to transform compliance into competitive advantage. SAP, SAPPHIRE NOW, SAP/4HANA and other SAP products and services mentioned herein as well as their respective logos are trademarks or registered trademarks of SAP SE (or an SAP affiliate company) in Germany and other countries. See http://www.sap.com/corporate-en/legal/copyright/index.epx for additional trademark information and notices. All other product and service names mentioned are the trademarks of their respective companies.